Although foldable and bendable displays are still far from being mass produced, a new patent by Samsung unveils a rotary dial display for a smartwatch that can provide basic information, taking it all to the next level. Samsung has been quite busy developing bendable and foldable devices in the last few years, some of them even being unveiled in the prototype stage at various trade shows or during special events. Unfortunately, the company still has to bring this technology to the masses. However, a new patent application that was recently published by the US Patent & Trademark Office reveals another interesting display, this time one that targets smartwatches. The Gear S2 introduced a rotary dial design, and its successor used it as well. 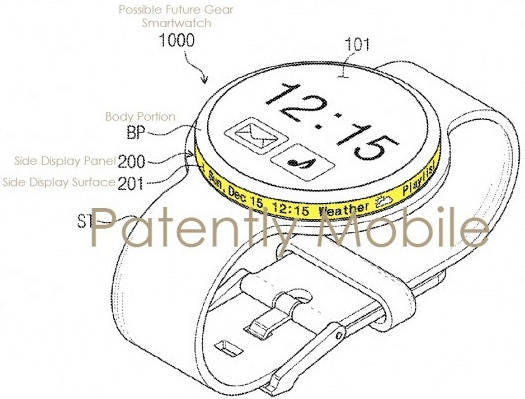 The new patent mentioned above describes a smartwatch with a secondary display placed around the rotary dial area, also naming this wearable a "possible future Gear smartwatch." 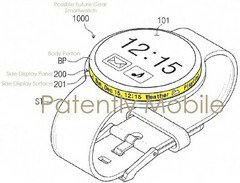 The patent description unveils that this display would provide "simple information, such as a current date, a current weather, a current playing song, etc." and its rotation is limited to 90 degrees. The rotary dial display technology described by Samsung's patent is a simple idea that can turn into an attractive feature offered by a next-gen Gear smartwatch. For now, nothing is official so it might take some time to see it integrated into a product for the masses.